When we moved to the Riyadh compound, it meant having constant contact with people. That meant neighbors became friends as well as random people who walked the loop. It didn’t take long to make many acquaintances and several very good friends. I loved to bake and experiment and so it was natural to invite the ladies over for a “dessert” night. I didn’t attend the weekly coffee mornings, so this was my way of meeting ladies and having fun. I made all kinds of interesting and different desserts and they graciously tried them, took some home and in general had a fun time chatting with other ladies from the compound. One special dessert that I experimented with was Florentines! I had always loved the delicate, lacy look to these special treats and so they became a favorite. Mix butter and sugar very well. Add syrup and flour. Mix all ingredients well and add nuts. I used walnuts this time, make sure there are no big chunks. Drop dough by teaspoons onto tray. Make sure they are far apart, they do spread out allot. Since this is Lynz REAL cooking and I always attempt to keep things “real”, I will post a picture of my mistake when I placed them too close together. It has been a few years since I made these, so I forgot this important tip! In the next two batches I only put 6 cookies and put them far apart. Place in oven and bake for 14-15 minutes. Remove from oven and cool for 2 minutes approximately, do not leave longer or they will harden. I will warn you they will still be fairly warm when you work with them and rolling them is a bit difficult so at this point you can just remove them to a plate and leave them flat for dipping if you like. Tip-I had several clean wooden spoons ready for wrapping the Florentines so that I could have one wrapped and cooling and be working on the next one right away. Beware they will still be hot and will harden quickly. After removing them from the oven and letting them cool slightly (2 minutes) remove one with a spatula, immediately lay over spoon and gently wrap around the end of your spoon, take care as they are fragile. Move to tray for a couple of minutes and remove spoon. Move onto the next cookie quickly. I usually get help for this process, otherwise they will harden! Melt chocolate and butter and whisk until smooth. Dip one end of the cooled Florentine into the chocolate and remove to a tray to dry. 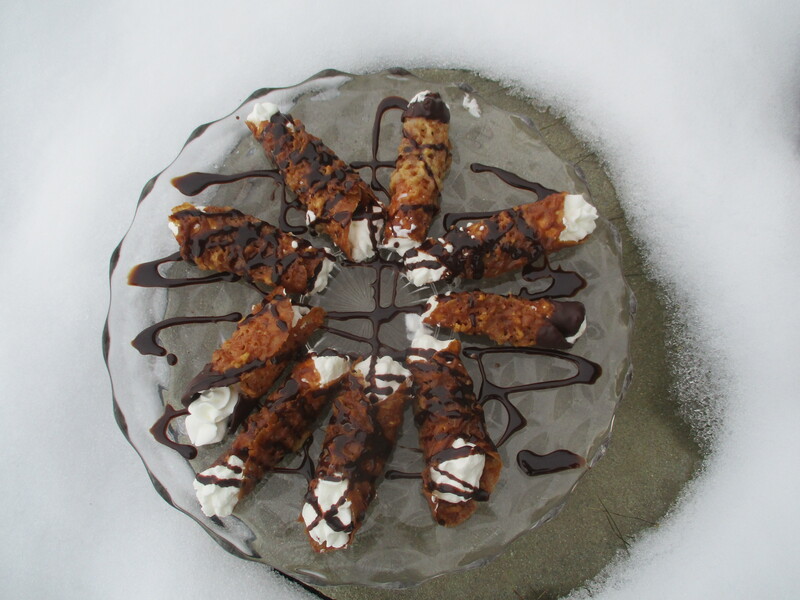 When Florentines are cool and chocolate is set, pipe sweetened whipped cream into each end. You can fill Florentines with different things but whipped cream is easiest! Refrigerate until serving.